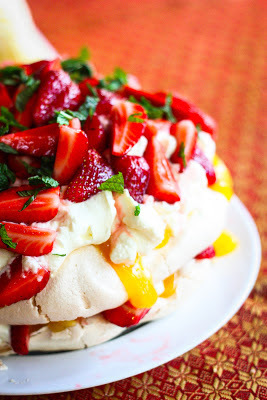 In 2012, I went from never having made a pavlova before, to making two in just as many weeks. I turned into a bit of a meringue-utan. 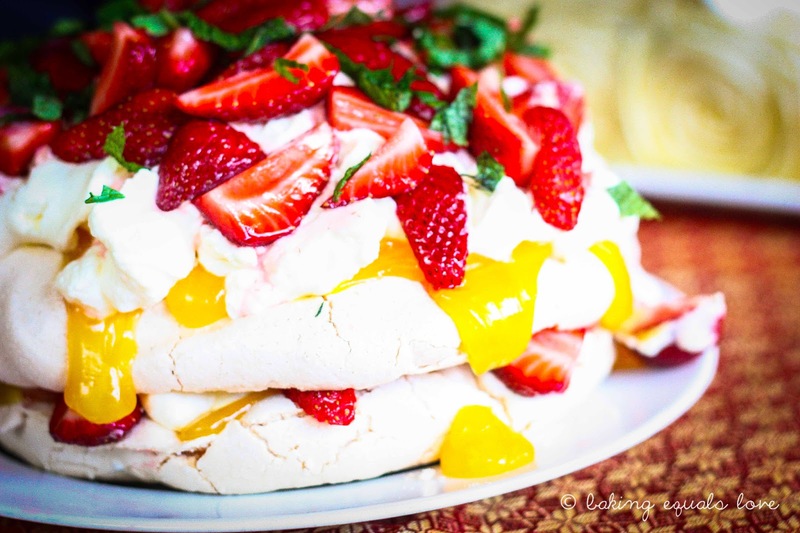 This Pavlova stack was made for my mother-in-law's birthday party. We have a relative who's gluten-free so I really wanted to make something that she could enjoy too. And it turned out so well that I ended up making another Pavlova for Christmas Eve dinner as well. 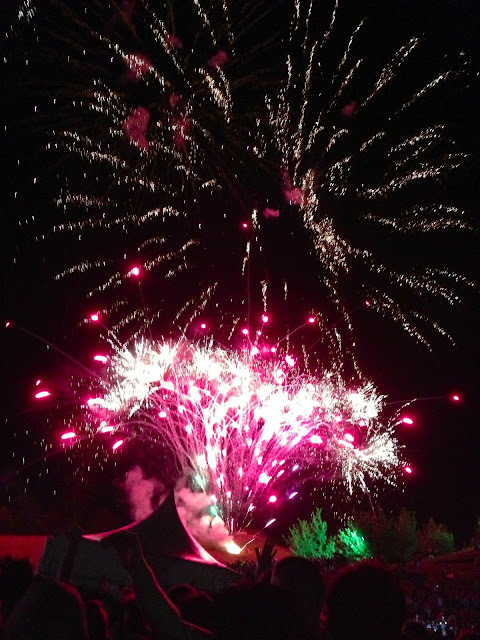 With it's Tower of Babel-esque stature, happy vibrant colours and ethereal airiness, it really was a most spectacular summertime treat. The stack structure turned out to be a cunning ploy to fool-proof my first go at Pavlovas: you see, even if the Pavs don't rise so well, you just layer on the lemon curd, whipped cream, and strawberries and no one's the wiser. Mwa ha ha. Although it was far from the perfect Pavlova (a little more height would've been awesome), it was fluffy and pillowy and still looked pretty even after a plane trip up to Auckland! And when combined with the tangy lemon curd, juicy summer strawberries, and fresh zesty mint, you have all the best tastes of summer in a glorious marshmallowy tower. An outrageously delicious marshmallowy tower. 1. Preheat oven to 130oC and line two cookie trays with baking paper. Draw a 22cm diameter circle on each piece of baking paper. 2. In a bowl whisk the sugar and cornflour together, making sure you get rid of all the lumps. 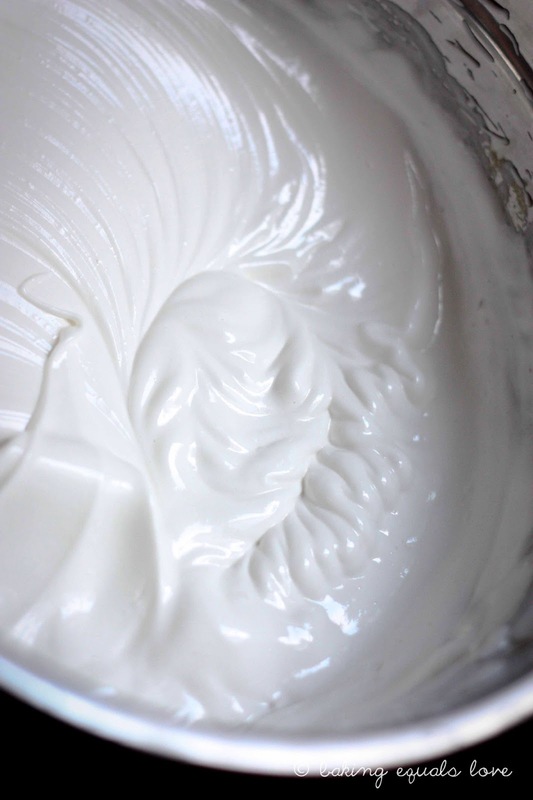 In a separate and extremely clean metal, porcelain, or glass mixing bowl (not plastic), beat the egg whites and cream of tartar until soft droopy peaks form when you lift the beaters out of the meringue mixture. 3. Gradually add the sugar/cornflour mixture a Tablespoon at a time until the mixture gets glossy, shiny and thick and you can't feel granules of sugar between your fingers. This should take at least 10 minutes. I used a hand held beater for this and it turned out great but did mean I had to stand over the bowl for like 20 minutes so a stand mixer would def make the whole process less taxing! 4. Beat in vanilla and vinegar till well combined. Spoon meringue mixture on to the circle you drew on the baking paper and make little peaks and swirls with your spoon to make it pretty. Bake at 130oC for an hour - don't open the door while it's baking or you'll get Pavlova pancakes! Turn off your oven, wedge a wooden spoon in the door to keep it ajar and let the Pavlova cool in the oven until completely cool. You can store the Pavlova layers in an airtight container at room temperature for around 3 days (don't put them in the fridge otherwise they will weep). 1. About 20 minutes before serving, cut the green tops off the strawberries and quarter. In a bowl mix the strawberries, sugar and chopped mint and allow to sit for 20 minutes. Give it a good mix before you layer on the Pav. 1. 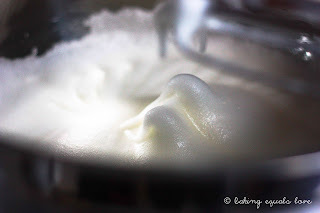 Beat the cream with icing sugar until soft peaks. Keep in the refrigerator until serving. 1. Start with your least good looking layer at the bottom. Spoon over lemon curd in dollops, smearing to get a roughly even spread. Next, scoop half the cream on top and arrange just under half the strawberries on top of the cream in an even layer. 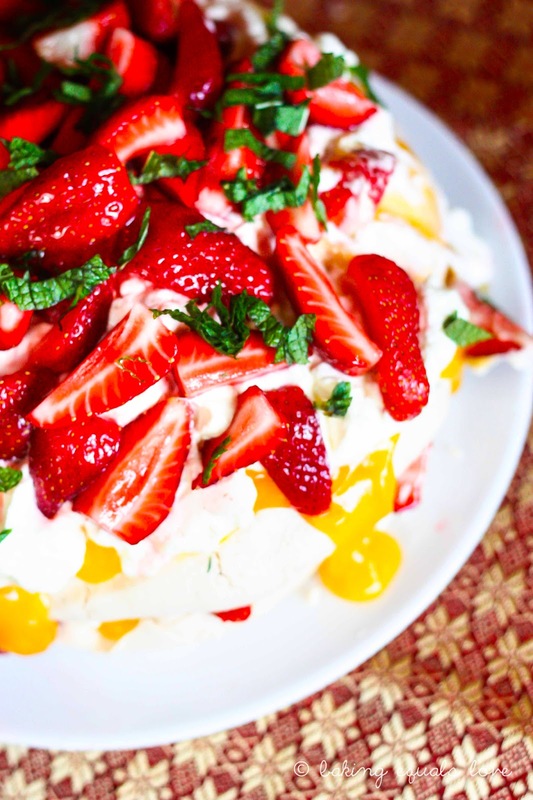 Place the second more majestic layer on top and repeat with the lemon curd, then cream then pile on the rest of the strawberries and sprinkle over the extra mint. Serve immediately. Pav by plane? That's so glamourous. 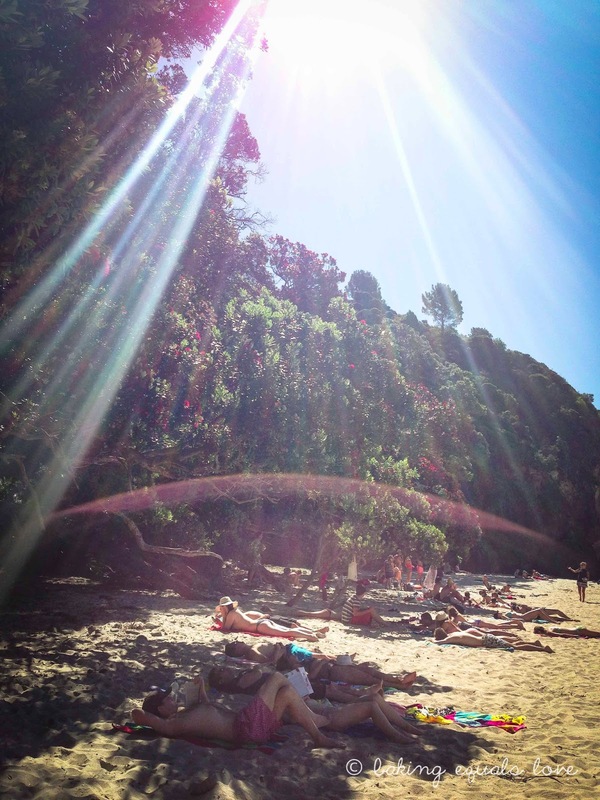 I'm so glad you posted this as I have pav on my to do list this summer too. I'm not a baker by any means, but I baked my first carrot cake this week so my first pav is hopefully on the cards soon. What are you doing with all your yolks? an awesome looking pav! what a stunner. the lemon curd is an inspired idea. Yum!! I love that you combined strawberries with both lemon curd AND mint. Brilliant! Wow. It's looks gorgeous. meringue-utan. So funny.